In saucepan over low heat, bring chocolate and half-and-half to simmer, whisking constantly. Simmer 1 minute or until mixture thickens slightly. Remove from heat; whisk in liqueur and vanilla. Pour into four 1/2-cup demitasse or coffee cups. 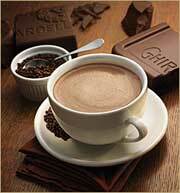 Top each serving with 2 tablespoons whipped cream; dust with Ghirardelli Unsweetened Cocoa (if desired). Serve immediately. Tip: Instead of amaretto, use 1 tablespoon hazelnut, coffee or orange liqueur or peppermint schnapps, or 1/2 teaspoon almond or peppermint extract.